In addition, embossing techniques are useful for creating raised lines in printable miniatures or metal sheets, to replicate punched pie safe designs or decorative plant holders​ or to produce raised paper surfaces for furniture or cornice trims. Regardless of whether you use metal foils or paper, the techniques are very similar. This is a different technique from embossing paper with stencils which is well demonstrated on the Family Crafts site, and which is another useful technique for many miniatures. Some miniaturists prefer to create embossed raised designs with heat set embossing powders used with special ink and rubber stamps. If you can find a suitable design, you can create simple embossed patterns this way, but they do not have the depth you can create in paper or metal with straight embossing or tooling techniques. Printable design, artist's fixative, thick glue, foam mat and embossing tools, used to create embossed metal or paper miniatures. Photo copyright 2009 Lesley Shepherd, Licensed to About.com Inc.
Pattern or Outline of a Design or a printable design like the one shown here for dolls house ceiling tiles. Any simple design will work for beginners, children's coloring books or stained glass pattern books often have good easy to work designs for practice. Embossing Tools These are available in a wide variety of styles. Empty ballpoint pens, or round ended cocktail sticks or toothpicks will work if you are careful. If you are buying an embossing tool, choose one with dual ends. Medium and large tips or fine and very fine can be found on a single wooden handled tool. Paper, Printable or Metal Foil Heavy kitchen foil will work, but lightweight foil is not suitable. The design shown here is a printable traditional ceiling tile design available in four dolls house scales. Other designs can be embossed on heavyweight papers. (See below for links to ceiling tile files). Artist's Fixative Spray This is only used on printable designs, to protect the ink from smudging as you work. Most archival artist's sprays will not discolor printer ink on paper. You should test spray a piece before using it on anything important. Paper printables will need to be sprayed on both sides. Soft Work Surface A piece of craft foam, a mouse pad or a folded piece of fabric will give enough to allow the foil or paper to emboss. 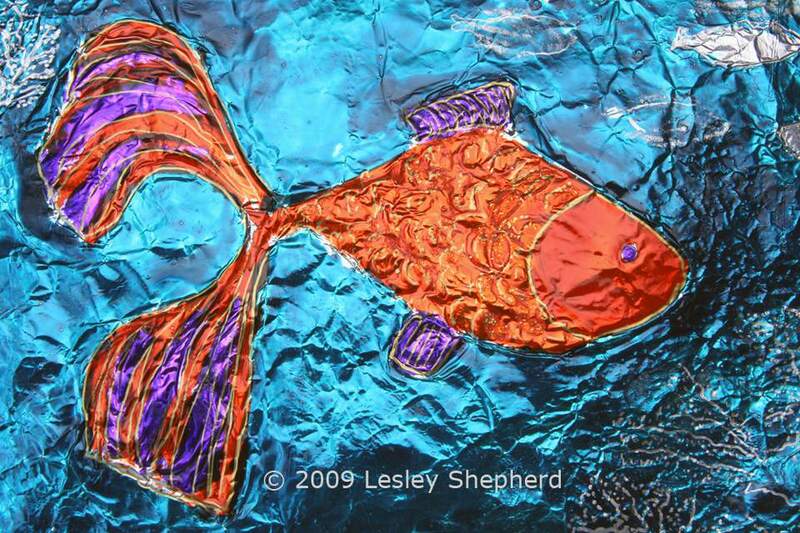 Paper will need a firmer surface than foil. Carving blocks for custom rubber stamps work well, as do sheets of flexible craft foam. See Through Ruler Useful for straight designs like the ceiling tiles. Thick PVA Glue or Artist Medium (Gesso) This is used as a filler behind the design to keep it from collapsing. If the design will be out of reach and not handled much (on a dolls house ceiling for example)you may opt to skip this step. To start embossing your foil or paper project, tape your chosen design outline to a piece of metal foil or a piece of sturdy paper. Heavier weight printer paper will work for this project, but you must be careful not to tear it as you work. Lightweight card stock or photo paper and flexible foil sheets are easier and more forgiving for a novice to use. Set your project so the design you wish to copy is face up and the paper or foil you wish to emboss is beneath it, resting on a soft craft foam surface or a mouse pad. Carefully run a medium sized embossing tool along the outlines on your design (not shown here as it is very difficult to photograph!) The photo above shows the back of the design once the outline is complete, and after some sections are embossed. If you are working on the printable ceiling tiles, use a ruler and lightly run your embossing tool over any dark straight line you see. Work on one section of your design at a time, turning it over when you think you have all the lines lightly pressed in. The back of your design should look like the left section of the photograph above, with thin outlines visible on the reverse of the foil or paper. Continue to finish all the outlines on the right side of your drawing. When you are satisfied you have all the major lines in place, remove the pattern (if you are using one, you may be working directly on a dolls house tile sheet or a printable) and flip the work over so that you can see the back. Now that you have all the outlines in place, emboss from the back by gently pressing on the areas between the outlines. This will raise these sections on the right side of the work. For larger open areas, Use your largest embossing tool and work with a circular motion, pressing the front of the design gently into the foam sheet you have beneath it. You can check your work by turning it over, and gently redrawing any outlines if necessary (on a printable). On foil designs, you can make the embossing more detailed by adding lines inside the outline lines which will cause a more abrupt embossing mark on the front of the foil work. Experiment with your technique to see what works for you. Avoid pressing to hard, or drawing your embossing tool too quickly across the paper or foil. This may cause surface damage. Work gently but firmly, always letting the embossing tool move smoothly across the surface of your paper or foil. If you have great difficulty, try a thicker paper or foil until you find one that works well for you. On paper, try to work your embossing from the center of the design outwards, so that your paper stretches evenly in all directions. If you jump sections or work unevenly, your paper may warp in places. To keep embossed metal foil or paper designs from collapsing, especial in humid areas, you can fill in the back of the design with gesso (the time-honored method) or use thick PVA glue or acrylic artist's mediums. If you are embossing a printable paper design, spray the back of the design with fixative, or coat it with a thin layer of acrylic coating to seal it before you apply a slow drying glue or gesso which could discolor your paper. Embossed foil designs will not need to be sealed before applying gesso or filler. To fill the design, use a glue spreader or a craft stick to create an even layer of thick glue or gesso across the back of your embossed design, while the design is gently resting on a soft foam surface. You want the glue to fill the shape of the design and set in place, you don't want to create a flat layer of glue after all your work on embossing. Set the design aside to dry. All glues and mediums will shrink slightly, so you may need to apply a second coat when the first one is dry. If you are using a colored paper printable (like the ceiling tile design) it is a good idea to test some of your filler or glue on the back of a test sample to see if your sealer protects the ink from dampness while the glue dries. If not, you may need to try a different sealing product or a faster drying filler. Inkjet inks vary in their response to moisture and glue. If your inkjet printable still gives you problems try embossing a color copy of the printable instead. Color copies use heat set inks which are more resistant to moisture than inkjet ink. If you are embossing paper and using gesso or thick glue or acrylic medium as a backing filler for your design, you may need to hold your paper in place while the backing medium dries in order to prevent your paper from curling. Embossed foil designs will not warp as the backing dries, so if paper proves a problem to emboss due to your printer, paper, climate or humidity, you may have better success with embossing foils! Have fun and experiment. This is a useful technique for shaping surfaces especially for smaller scale buildings, where the designs do not need to be heavily embossed. When finished, the top surface can be painted, dry brushed, or glazed with semi-gloss coatings to age the finish. Embossed paper with no backing is more difficult to distress or age, without changing the shape of your embossing. If you want to try this on a small project, try it on faux leather spines or covers for miniature books, or create tiny raised designs in foil for the top of beauty or powder jars.